Built in the 11th AD, the Kaisariani Monastery is situated on the slopes of Mount Hymettos, around 5 kilometres from the city of Athens. The Monastery has an interesting history. The monastery was built over the ruins of a Roman temple which in turn was built over an ancient Greek one. Four columns of the ancient temple have survived and to this day support the dome of the monastery's church. The monastery walls are covered with 16th century paintings and frescoes. Around the courtyard on the monastery, one can find a mill, a bakery, a cafeteria and a bathhouse. 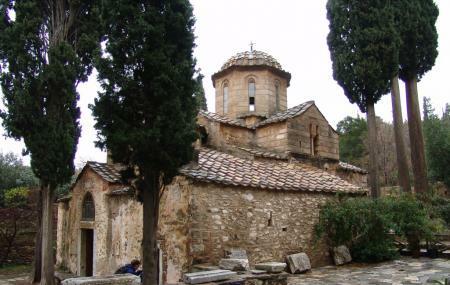 The Kaisariani Monastery is also a starting point for hikes on Mount Hymettos. Approximately 3 kilometres of walking is required from the nearest bus stop to the Monastery. It is still an active place of worship, dress appropriately. Cafe in the premises of the Monastery. Free for people less than 18 years. How popular is Kaisariani Monastery? People normally club together Athens Airprot and Numismatic Museum Of Athens while planning their visit to Kaisariani Monastery. Ena grafiko ekllisaki mesa sta dentra tis kaisarianis. ΣΥΜΠΑΘΗΤΙΚΟ ΜΙΚΡΟ ΜΟΝΑΣΤΗΡΙ . ΠΟΤΙΣΤΕ ΑΔΕΛΦΕΣ ΚΑΙ ΚΑΝΕΝΑ ΔΕΝΔΡΑΚΙ. ΟΛΑ ΞΕΡΑ , ΕΞΩ ΑΠΟ ΤΟΥΣ ΤΟΙΧΟΥΣ ΔΕΝ ΕΝΔΙΑΦΕΡΕΤΑΙ ΚΑΝΕΙΣ?